Spleen tyrosine kinase (Syk) is an important mediator of inflammatory signals from extracellular receptors to the nucleus of immune cells. Inhibiting Syk with the oral, small-molecule inhibitor fostamatinib has shown efficacy compared to placebo in a short term study of RA patients on background methotrexate. Here, Weinblatt et al (NEJM 2010; published online ahead of print on September 22, 2010) report six month efficacy and safety data of fostamatinib for the treatment of RA. RA patients with active disease were randomized to receive treatment with fostmatanib 100 mg twice daily, 150 mg daily, or placebo. Patients were required to be on stable background methotrexate, but could also be on other stable background sulfasalazine, anti-malarials, NSAIDS, or low dose prednisone. Prior TNF inhibitor and leflunomide use was permitted, but required washout prior to enrollment. The primary efficacy outcome was ACR20 response at 6 months. Safety outcomes were monitored throughout the study. A total of 457 patients were enrolled; 304 to either of the fostamatanib doses (equally apportioned) and 153 to placebo. Characteristics of the patients were typical for RA clinical trials. The average age was around 50 years, most (85%) were female, with an RA duration of around 9 years and an average DAS28 score at enrollment of 6.15 units. The average number of swollen joints was 12. Because many of the enrollment sites were in Central and South America, the prevalence of Hispanic ethnicity was nearly 50%. Baseline characteristics were balanced between the treatment groups. Dropouts were 21% of the placebo group compared to 16% of the active treatment groups. Clinical responses are described in the table (below). Patients receiving the highest dose of study drug had higher responses than those receiving the lower dose or placebo. Differences in response compared to placebo were observed as early as the first week of the study. There were 21 withdrawals from the study due to adverse events (15 from the active treatment groups). Adverse events that were increased in the active treatment groups compared to placebo included diarrhea, upper respiratory infection, neutropenia, abdominal pain, and hypertension. For the open label extension, all patients received active drug and were followed for an additional 6 months (n=297). Of these, 69 (18%) withdrew—19 for inefficacy and 21 for adverse events (nausea, diarrhea, elevated liver function tests). There were 3 deaths in the open label extension phase (septicemia, cerebral hemorrhage, and sudden death) and 24 additional serious adverse events (among which were a B-cell lymphoma, cervical carcinoma, and a myocardial infarction). The oral Syk inhibitor fostamatanib was superior to placebo in reducing the signs and symptoms of active RA, with higher doses demonstrating more robust efficacy. Some adverse events, such as diarrhea and hypertension, were higher among treated patients. Kinase inhibitors represent an exciting new area of pharmacotherapeutics in RA. For fostamatinib, oral administration, the magnitude of efficacy, and quick onset of action are compelling aspects. Side effects, such as nausea, diarrhea, and hypertension are issue to follow in further studies, and it is yet unclear whether these will emerge as nuisance side-effects that can be managed, or whether they will limit the wide application of the drug. Additional study is required to determine long-term safety of the drug, particularly in terms of serious side-effects, such as cardiovascular events, infection, and malignancy. The dosage of rituximab commonly used in clinical practice (1000 mg infused twice, separated by two weeks) is largely empirically based. It is unclear whether lower doses will result in reduced efficacy or improved safety. Here, Emery et al (Ann Rheum Dis 2010; 69: 1629) explore patient outcomes in RA patients treated with 2 x 500 vs. 2 x 1000 mg of rituximab. Adult RA patients with active disease despite background DMARDS and no prior biologic exposure were randomized 1:1:1 to receive one of three treatment regimens: rituximab 2×500 mg; rituximab 2x1000mg; or placebo. Enrolled patients washed out of other DMARDS, but continued on background methotrexate. The primary efficacy endpoint was the ACR20 response at 24 weeks. Other responses were assessed at 24 and 48 weeks. Retreatment occurred after 24 weeks, and was administered to patients not in remission. Patients received their original dose of rituximab or, if initially on placebo, were retreated with rituximab 2x500mg. A total of 509 patients received at least one study infusion. Patient characteristics were typical for RA clinical trials (i.e. mean age around 50 years, predominantly female (approximately 80%), predominantly Caucasian (80%), with a RA disease duration of approximately 7 years. The mean DAS28 was just under 6 units at enrollment. Almost half of enrolled patients were receiving corticosteroids. Baseline characteristics were balanced between the groups. The majority of patients completed 24 weeks (92% in the placebo group and 96% of the rituximab groups). Approximately 90% of the patients in each of the groups were retreated and the same proportions were followed out to 48 weeks. Patients receiving either rituximab regimen had similar response scores, which, for ACR20 and 50 responses, were significantly greater than those of the placebo group at 24 weeks. For week 48 responses, there were no significant differences between the rituximab groups. Other outcomes (absolute improvement in DAS28 scores, fatigue scores, disability, etc…) did not differ by rituximab dosage. Adverse and serious adverse events were not different between placebo and either treatment group, although infusion reactions at the first infusion were more common among rituximab 2×1000 mg patients (25%) compared to rituximab 2×500 mg (19%) or placebo (14%). There was no difference in CD19 suppression or effect on immunoglobulin levels between the two rituximab regimens. There were 2 deaths (interstitial lung disease and abdominal sepsis) between weeks 24 and 48 among patients in the rituximab 2×500 mg group. There was no clinically important or statistically significant difference in clinical response or safety between a reduced rituximab regimen (2x500mg) and standard dosing (2x1000mg). These data convincingly demonstrate that, at least for the first infusions of rituximab, that a reduced dose is not associated with a reduction in efficacy. However, it is not clear what the impact would be on subsequent infusions (where, in many patients, efficacy may actually improve and the duration of effect more long-lasting). In addition, it is unclear what the effect of dose reduction would be on radiographic damage, since this outcome was not reported in the manuscript. Unpublished data (presented at the 2009 American College of Rheumatology meeting) suggested that suppression of radiographic progression was only observed in patients receiving rituximab 2x1000mg, and not the reduced dose. Thus, since there does not appear to be a strong safety benefit from the reduced dose of rituximab, it would still appear prudent to continue treatment with 2x1000mg until further clarification of the effect of the reduced dose on radiographic damage is known. Ingestion of dairy products has been associated with a lower risk of gout in observational studies. However, the mechanism underlying this protective effect is unstudied. In addition, the association could be related more to health behaviors associated with milk drinking, such as better general health and less consumption of alcohol and red meat, rather than milk itself. To address these issues, Dalbeth et al (Ann Rheum Dis 2010; 69:1677) report the results of a randomized controlled trial of milk consumption on serum urate levels. 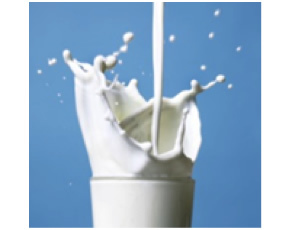 Healthy male volunteers with normal renal function and no history of gout were randomly assigned to consume one of the following: soy milk (control group); early season skim milk; late season skim milk; or ultrafiltered MPC 85 skim milk. Late season skim milk was selected as it contains high levels of orotic acid, proposed to be a uricosuric, while ultrafiltered milk has low levels. The products were equal with respect to protein content (80g). Blood and urine was sampled before consumption and at 60, 120, and 180 minutes post-consumption. Each study subject returned for 4 total study visits in which each remaining milk product, randomly allocated, was consumed. A total of 16 men were studied. Median age and body mass index was 34 years and 24.6 kg/m2, respectively. Baseline serum urate, purine metabolites, and urine fractional excretion of urea were balanced between the groups. Among the milk products, soy contained the highest concentration of purines and the lowest concentration of xanthine oxidase (the enzyme that catalyzes the conversion of insoluble urate to more soluble products). Uric acid was lowest, and orotic acid highest, in late season skim milk. Ingestion of soy milk was associated with a 10% increase in serum urate. In contrast, all of the milks were associated with a 10% reduction in serum urate over the 3 hours study interval. An increase in fractional excretion of urea was noted in all the groups, highest with late season milk and lowest with MPC 85. Ingestion of any of the studied products was not associated with any significant change in serum purines or purine metabolites. All products led to an increase in the fractional excretion of xanthine that did not differ between groups. Intact milk has a uricosuric effect that may mediate the observation of a protective effect of diary consumption of the development of gout. This is an interesting study that helps to define the mechanism linking diet with hyperuricemia and gout. In dietary counseling of patients, care providers may tend to focus on foods known to increase gout symptoms, such as shellfish, red meat, and alcohol. However, it may be also helpful for patients to know about the potential for protective foods. This particular study does not prove that increasing milk consumption reduces serum uric acid or prevents gout flares in people with prevalent gout; however, given that increasing milk consumption is not harmful and may have beneficial effects beyond a potential uricosuric effect, then there is likely little harm in recommending this strategy in the absence of a study specific to gout patients. In addition, all of the patients in this study had normal renal function. In general, the effect of uricosurics is blunted in patients with renal dysfunction, raising the possibility that increasing milk consumption may have little to no effect in individuals with kidney disease, which, unfortunately, is the majority of patients with gout. Are TNF Inhibitors Efficacious for the Treatment of Sciatica? Inflammatory cytokines are implicated in the painful symptoms of sciatica, a common form of lumbar radiculopathy associated with intense pain and dysfunction. Case reports have suggested that TNF inhibitors may improve pain in individuals with sciatica. However, since sciatica is often self-limited, uncontrolled reports of efficacy may be misleading. Here, Genevay et al (Arthritis Rheum 2010; 62(8): 2339) report the findings of a randomized, blinded, placebo-controlled trial of the TNF inhibitor adalimumab in individuals with acute and severe sciatica. In this multicenter clinical trial conducted in Switzerland, adults with radiating leg pain in the L4-S1 dermatomal distribution lasting < 12 weeks, with severe pain based on the Oswestry Disability Index, and inadequate pain management using conservative methods (I.e. opioids and glucocorticoids), were randomized to receive 2 injections of adalimumab (40 mg per injection) or comparable placebo separated by 7 days. Participants and staff were blinded to treatment allocation. Patients were followed for change in leg pain (recorded by the participant on a 0-100 visual analogue scale) for the first 10 days, and at weeks 6 and 24. Other outcomes studied were low back pain, disability, quality of life, and the need to undergo back surgery. Among 265 screened patients, 61 were eligible and randomized. Most were male (57%) and approximately 50 years of age. The mean duration of sciatica was about 3.5 weeks. Most had prior back pain and had stopped working due to sciatica symptoms. Groups were balanced on baseline characteristics. All of the patients allocated to adalimumab, and 26 allocated to placebo completed the study. Leg pain improved with time in both groups; however, there were early (during the first 2 days after the first injection) and late (at 24 weeks) differences in leg pain favoring the adalimumab group. However, between days 3 and 42, there were no differences in leg pain between the two groups. Improvements in back pain were more pronounced in the adalimumab group across the entire study time course, and were significantly lower at most time points in the adalimumab group. At 6 months, 65% of patients in the adalimumab group were considered responders for change in back pain, compared to only 27% of the placebo group (p<0.01). There were no emergency surgeries performed; however, 7 of the adalimumab treated patients compared to 18 of the placebo treated patients underwent surgery (p=0.04). Compared to placebo, two injections of adalimumab improved back pain, reduced the need for surgery, and (to a smaller extent) reduced leg pain associated with acute sciatica. While this trial does demonstrate some robust efficacy data against placebo for back pain and need for surgery with adalimumab treatment for sciatica, it is still not clear from these data whether this is a clinical useful treatment strategy. For one, adalimumab is considerably more expensive (even for two injections) than other anti-inflammatory agents (NSAIDs and glucocorticoids). Thus, a clinical trial with a comparator against these standard of care regimens is required before making the leap to adopting TNF inhibitors into routine practice for acute sciatica therapy. Are the Incidence and Prevalence of RA Changing in the United States? The epidemiology of rheumatoid arthritis (RA) is influenced by a number of factors, including survival, changes in diagnostic tools, and temporal trends in environmental factors that may promote or protect from disease. Here, Myasoedova et al (Arthritis Rheum 2010; 62(6): 1576) explore the trends in RA incidence and prevalence over 50 years in a population-based cohort study conducted in Olmsted County, Minnesota. Linked records for participants included in the Rochester Epidemiology Project, which includes nearly all of the inhabitants of Olmsted County, Minnesota, were examined for RA diagnosed between 1995 and 2007. Questionable cases were adjudicated by the investigators. Incidence and prevalence estimates were tracked over time and added to prior estimates collected for the period 1955-1994. Incidence rates were age and gender adjusted to the population of U.S. Caucasians from 2000. Among 1,761 arthritis diagnoses in adults between 1995 and 2007, 466 were confirmed as having RA. Most were female (69%) with a mean age of 56 years at diagnosis. 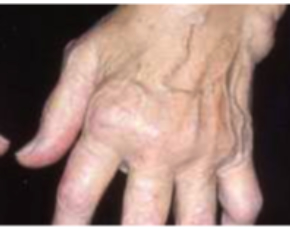 Rheumatoid factor (RF) was present in 66% and 20% had evidence for erosions within the first year after diagnosis. Compared to prior periods, smoking in men, but not women, had decreased from the 1985-1994 period. The demographic adjusted incidence rate for RA was 41 per 100,000 (95% CI 37, 45), 53 per 100,000 in women and 28 per 100,000 in men. The maximum incidence was in the age group 65-74 years of age. Over the decade studied, RA incidence increased 2.5% per year in women (95% CI 0.3, 4.7%); however, there was no significant change in men. There was no difference in incidence rate trends according to RF status or age at diagnosis. Accordingly, the prevalence of RA increased in women (0.98% compared to the estimate of 0.77% from the previous decade), but was unchanged in men. From these prevalence rates, there are an estimated 1.5 million U.S. adults with RA. Recent trends in RA incidence from Rochester County, Minnesota indicate an increase in women, but no change in men. These are interesting findings, considering that prior estimates had indicated a decline in RA incidence over the preceding several decades. The reasons behind the increase in women are unclear. Smoking is a strong risk factor for RA, and rates have not declined in U.S. women compared to men. Thus, it is possible that smoking could be the environmental risk factor implicated in the rise in RA incidence described here; however, other factors may contribute. Another explanation for the increase may be shifts in diagnosis, particularly the additional of anti-CCP antibodies to clinical practice. Shifts in diagnosis may result in including patients with milder disease who may not have been classified previously with RA; however, one would expect changing trends in diagnosis to affect men and women equally.